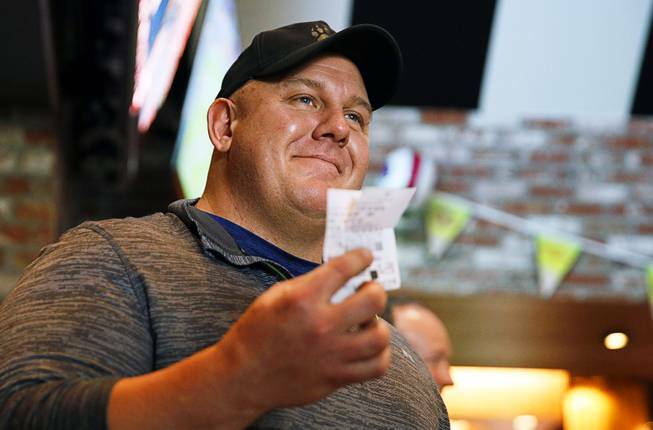 James Adducci holds up his winning ticket after winning more than $1 million betting on Tiger Woods winning the Masters, Monday, April 15, 2019, in Las Vegas. Tuesday, April 16, 2019 | 2 a.m.
With snow still on the ground in his Wisconsin hometown, avid golfer James Adducci said he’s been a little bored this spring. Adducci, 39, had a hunch about Tiger Woods’ chances to win The Masters, traveling to Las Vegas to wager $85,000 on Woods to win the prestigious tournament at 14-to-1 odds on April 9. Adducci on Monday cashed in his ticket at the William Hill sports book at SLS Las Vegas and was presented with a $1.275 million check. Woods won the tournament Sunday, his first major championship in more than a decade. It was the largest payout ever for a William Hill golf wager. A stock trader by day, Adducci said the wager was the first he ever placed. He said he needed to “move some investments around” to free up money for the bet. He first tried a couple of other sports books, he said, but was turned away. “When I said how much I was looking to bet (at the other sports books), it was kind of laughable. I just wanted to do what I wanted to do,” he said. With his big win in tow, Adducci said he’s talked to William Hill officials about possibly placing a bet on Woods to win golf’s grand slam — wins at The Masters, U.S. Open, British Open and PGA Championship — this year. Exceptionally rare, William Hill, as of Monday afternoon, was offering 125-to-1 odds for Woods to complete the grand slam. Having learned the game of golf from his father, Adducci said he had a feeling Woods — playing and in contention during a major tournament in front of his two children for the first time — would perform well. Adducci nervously watched the final round from home. When Adducci ran the idea of the bet by his father, the elder Adducci wasn’t thrilled with the prospect. Adducci said watching the tournament play out was an emotional roller coaster.